Due to its exceptionally clear design and its versatility, the bathroom series Duravit Happy D has gained an extraordinary popularity and has moved into a number of family bathroom rooms. Meanwhile, the Duravit Happy D bathroom collection has been newly released and optimized. Convince yourself of the variety of Duravit Happy D2 wash basins, toilets, bidets and cisterns. 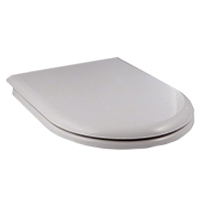 Since there are still Duravit Happy D WCs in numerous bathrooms, you will find the right Duravit Happy D toilet seat with us, too.